We are a leading Manufacturer of grill perforated rolling shutter and perforated rolling shutter from Nagpur, India. Under the rigorous management and supervision of our professionals, we have come up with a well-known assortment of Grill Perforated Rolling Shutter. Examined on varied levels of designing and quality examination, these provided products are inclusive free from faults. Along with this, to assist their safety during shipment, these are delivered by us after getting packed in supreme quality packing material. 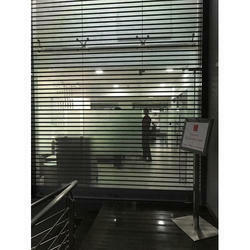 We have emerged as a foremost manufacturer of Perforated Rolling Shutter. The offered shutter is designed using premium quality materials and latest designing techniques. Our offered product is widely demanded among the clients for their long life and other salient attributes. Offered product find usage in both, domestic and commercial sectors. Further, we provide is product in different finishes and specifications in accordance with clients’ requirements. Our valuable clients can avail this shutter from us at industry leading prices.